It’s never easy to predict what will prove to be the most popular Christmas gift for any given holiday season. Whoever would have imagined that Cabbage Patch Kids would be the hottest thing since refried beans con queso? Or that Tickle Me Elmo would capture the nation’s imagination in a way that the talking George Bush action figure never would? Picking the gift that will pick the pockets of holiday shoppers from Barstow to Brattleboro has never been easy, but this year I’ve got a bona fide front-runner that can’t – and won’t – be ignored. Say “Merry Christmas!” to the life-sized, electronic chimpanzee head. In a retail world grown weary of radio-controlled Humvees and ho-hum Bratz dolls, the severed chimpanzee head is like a breath of fresh air at a Republican fundraiser. Four distinct moods? Hell, half the people I work with here in the newsroom don’t have four distinct moods. And it comes with a remote, so you can interact with your remarkably lifelike chimp head from across the room. Best of all, it’s only $139.97. Oh, sure, it might seem a little expensive at first glance, but remember what we’re talking about here – a life-sized, interactive chimpanzee head with four distinct moods. And, if you buy in bulk, you can pretty much wrap up all your Christmas shopping with one triumphant march through the chimp department at Wal-Mart. For example, if you have 10 people on your holiday gift list, you can get each of them a lovable chimp head this Christmas and take care of the whole bunch for less than $1,500. After all, if you’re a typical resident of S’lano County, you probably spent more than that on gin and Vienna sausages last month. Your friends and relatives may quickly forget the oversized candy canes and jingle bell socks you normally hand out at this time of year, but they’ll never forget opening up a colorfully wrapped Christmas present and discovering a lifelike severed chimp’s head inside. And life-sized chimp heads are so versatile. You might want to keep your own chimpanzee head on the living room mantel, on your desk at work or, perhaps, impressively riding shotgun in your Hyundai. Having a jolly Christmas dinner with the family? Slyly bring your life-sized electronic chimpanzee head to the table on a covered platter, then lift the lid with a dramatic flourish. You can bet you’ll be the envy of the celebration. Remember to shop early, amigos – these chimp champs are sure to sell faster than you can say bonobo. There are a few essential books in existence without which no true Californian’s library is complete. 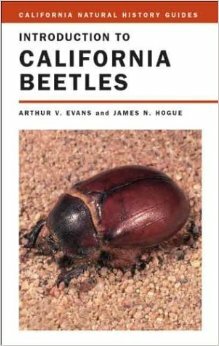 One such volume is the all new “Introduction to California Beetles” by Arthur V. Evans and James M. Hogue (2004, University of California Press, Berkeley, $14.95, 299 Pages). With this easy-to-use guide, you’ll no longer look like a complete doofus when you can’t readily identify the six-legged visitor who’s dropped, unannounced, into your beer at the company picnic. Instead, you’ll wow your companions when you glance into your mug and proclaim “Imagine that – a Spotted Dung Beetle. You hardly ever see them around here, and very few of them are known to drink beer. “California is beetle country – more than 8,000 species call the Golden State their home – and being unfamiliar with these varied and industrious organisms who share our state is tantamount to not being able to tell a redwood tree from an oleander bush. California beetles are everywhere, all the time, and their lifestyles are at least as interesting as Michael Jackson’s on any given afternoon. Armed with “Introduction to California Beetles,” you’ll be able to expound endlessly on the habits of the zany but purposeful Whirligig Beetle (Gyrinidae) and thrill to the defensive strategy of the Head-Standing Stink Beetle (Eleodes). The latter arthropod defends itself by standing on its head and discharging noxious chemical compounds from its behind to drive away potential enemies. Even more remarkable is the Bombardier Beetle. According to Evans and Hogue, these beetles are living chemical warfare factories. “Bombardier Beetles store the components of their arsenal in separate chambers. When attacked, the hydroquinoners, hydrogen peroxide, peroxidases and catalases are injected into a third chamber. The resultant synergistic reaction explodes out of the body with an audible pop, producing a small yet potent cloud of acrid spray that is literally at the boiling point,” write Evans and Hogue. (Kind of makes the old California mountain lion seem sort of benign, doesn’t it?). And Bombardier Beetles are only a small part of this remarkable volume. You’ll also get to know everything you ever wanted to know about the Confused Flour Beetle, the Red-Legged Ham Beetle and the Enigmatic Scarab Beetle. Somewhere, somehow, I must have offended the ant gods – you know, the vengeful insect deities rumored to hold court behind a shimmering gold Dumpster just south of Barstow? Trouble started last week when I climbed into my car, sleepily flicked on the defroster and promptly got a face full of ants. Hey, I’ve battled ants in the kitchen and ants in the bathroom and ants on the dining room floor, but never have I had to do battle with ants in my car. Overcoming my initial shock, I quickly inspected the rest of my auto and found that the entire passenger compartment was infested with industrious hordes of the tiny black insects, marching purposefully back and forth across the dashboard, down the center console and along the doors.I eventually removed some of the tiny troublemakers from my steering wheel and drove to work, hoping that my better-informed colleagues might offer a solution to the problem. Never expect useful advice at work. One genius recommended blasting the entire interior of the car with a high pressure hose. Yes, this might get rid of the ants but I suspect it would also play hell with the car’s electronics. “Just spray ’em with a big ol’ shot o’ Raid,” another colleague suggested. Oh, yeah. That’s a good idea. Then the next time I hit the defroster I get a face full of dead ants and enough insecticide to kill a trophy lobster. One can, of course, try to eliminate the problem by vigorously smacking the six-legged pests, but that extermination technique presents its own set of unique challenges. Think about it – you’re cruising down the interstate when you observe a high-kicking chorus line of ants dancing across your dashboard, just daring you to take a swipe at them. This is, of course, impossible to resist, so you begin enthusiastically smacking them. You’re now straddling two lanes of the interstate and going for three, drifting dangerously close to the road shoulder at somewhere between 45 and 75 mph as you escalate hostilities against your diminutive antagonists. “Hmmmmm. Lookit that. Hmmmmm – pull him over or just shoot him? “If you somehow survive driving with 12,000 or so of these rowdy little passengers on board, you’ll soon find out that ants will enthusiastically infest a lot more than your automobile. They’ll climb into your coat, slip into your shirt and penetrate your pants before you’ve driven around the block, effectively annihilating whatever’s left of your rapidly deteriorating driving skills. I hate to admit it, but in my case it appears that the ants are rapidly gaining the upper hand. Dumpster phones: Threat or menace? I usually have some kind of answer, since my old ’60s sidekick calls regularly from the pay phone outside the bait shop in Coos Bay to tell me exactly what he’s been up to – endlessly and in great detail. Forever lost in the Age of Aquarius after ingesting some unidentified herbs near Bolinas in 1968, Sapper usually gets chatty about 3 a.m. and begins calling acquaintances from Barstow to Boston to let everybody know how his pet scorpion got stuck in the waffle maker. Or why George W. Bush’s middle initial proves he’s a renegade Belgian pole vaulter on the run from Interpol. Unfortunately, Sapper entered 21st-century communications three weeks ago when he abandoned the bourbon-marinated pay phone outside the bait shop for a state-of-the-art cell phone he found in a nearby Dumpster. Dumpster phones – don’t ya just love ’em? Then there are some bird calls and stuff. Try as I might, I can’t convince Sapper that a cell phone found in a Dumpster beside a bait shop might not be the most effective form of Oregon-to-California communication. Sapper, you see, is an incorrigible optimist. His glass is never half-empty, it’s always half-full. The Dumpster phone, he’s told me, has got to be the find of the century. He’s never seen one like it, so it’s got to be unique – probably an ultra-high-tech cell phone developed by a secret government agency and then abandoned when relentless Albanian spies began to close in on the old bait shop. “Why else would it be there?” he asked quite reasonably over the sound of someone strangling a weasel. So what’s Sapper been up to? Sapper, it seemed, was on his way to board a sailing craft to go somewhere. Or not. This whole scenario might fit nicely into one of those vaguely amusing Sprint PCS phone commercials, but somehow I kind of doubt that Sprint has a lot of competition from the Oregon Dumpster phone industry. Doling out a paternal slap upside the head with a hearty chuckle, I gave the trusting lad all the usual explanations for Seahawks fandom. “Remember, son, no other team in the National Football League plays quite like the Seahawks. How many other quarterbacks do you know who routinely spike the football into the center’s helmet, or hand off that old pigskin to the opposing team’s head cheerleader? No, son, you’re never going to get bored watching the Seahawks as they, er, dominate the field,” I explained. Respected football commentator and former coach John Madden, I pointed out, once described the Seahawks as the greatest mystery in American football. “Hey, everybody loves a good mystery…” I enthused. My son, however, is considerably older now (if anybody who’s 25 years of age can be ‘considerably older’ than anything), and I fear that sooner or later I’m going to have to tell him the truth about being a Seattle Seahawks fan. After all, I was the one who convinced him that the soaring Seahawks were going to win the 1988 Super Bowl. Sad as it seems, I’m going to have to tell him that he’ll never have an opportunity to be anything but a Seahawks fan. Our reputation has become so grotesque that no other team in the NFL will accept us as fans. Each of us is like a landlocked Flying Dutchman, blown from stadium to stadium with no hope of ever finding a safe harbor. According to secret documents I’ve obtained from a mole deep within the NFL, there are exactly six Seattle Seahawks fans residing within the state of California. That includes me, my son, three guys here at the newspaper and a chemically-challenged bicycle thief in Barstow. Our identities have been noted throughout the league and any attempted defection to another team is invariably met with strong opposition. For example, if I decided to become a Baltimore Ravens fan, I would probably receive a stiff form letter from a Maryland law firm explaining in no uncertain terms that there are no current fan vacancies within the Ravens’ organization. On the other hand, trying to become an Oakland Raiders fan could easily land me in San Pablo Bay with an engine block tied around my neck. I suppose I could advise my son to change his name, dye his hair, obtain a Belgian passport and follow the Canadian Football league for a few years before trying to insinuate himself into the ranks of Detroit Lions or Cleveland Browns fans.